In no age group last year did women surpass 40% Birkie participation. This year, at least 40% of skiers age 22 and 23 were women. Up until age 30, about a third of Birkie skiers are women. For Korte skiers, until age 40 or so, more than half the race is female, and for the big bump in their late 40s and early 50s, nearly half of the skiers are women. For 28-year-olds in the short race, more than 80% are women (although there were only seven men in that age group; 75 28-year-old men skied the longer race). As expected, there are few women in the first wave, where women comprise less than 5% of the skiers—as most women who qualify in to the first wave can make it in to the Elite Wave; it’s a boys club. However, women quickly comprise more of the waves, so that by the later waves women make up more than a quarter. And, yes, in the classic race, there was the same number of men and women. 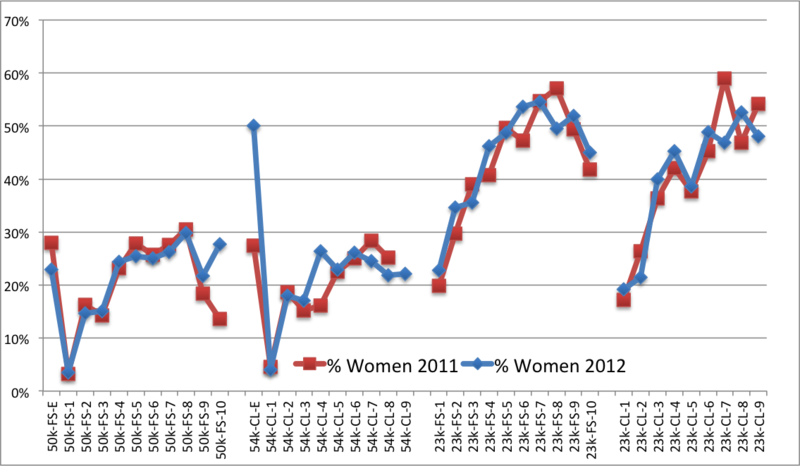 Ah, but in the Korteloppet, women, especially in the skate race, quickly rise from 20% of the skiers to more than 50% by wave 4. And here’s the breakdown for every wave of every race on one fun chart.